The Swift is Six Moon Designs “ultralight” backpack, and for a pretty good reason. 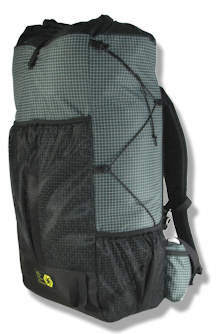 The newly designed 2011 Swift pack is listed at a scant 15 oz, although, this is without a hip belt or an aluminum stay. However, part of the redesign of the pack was to make the pack more versatile. What this means is that the pack will now accept an optional (removable) hip belt as well as an aluminum stay. The pack does however sport an inner pad pocket which will allow a users sleeping pad to be folded and then inserted into the sleeve which then provides the actual structure for the pack. The Wing Belt: Features large dual hip belt pockets and is offered in a size small (4 oz), medium (4.5 oz) and large (4.5 oz). All sizes cost $30 extra. The Swift is also built so that an optional aluminum hoop stay can be inserted into the pack which is a great option for people who do not use foam sleeping pads. Using this stay will create an internal structure and removes the need for a foam pad to provide the structure. The stay is listed at 4 oz and cost $20. Now onto some of my thoughts on the pack as well as how it packs up for me for my intended use. Finally I realized that the pack was not going to work with my gear with the stay inside the pack. The stay was making the pack too big, so it had to go (bummer I just spent $20 extra for it…) However, I wasn’t too keen on using a ccf pad in the pad pocket. I use a NeoAir and at this time of the year I do not need a second pad. My point of getting this pack was not only to have a smaller pack, but also to reduce weight. By carrying an extra pad I am looking at carrying extra, unneeded weight. However, if I did not use the stay, my only other option for me was to use a ccf pad. I ended up buying a cheapo blue ccf pad and chopping it down to fit inside the pad pocket. After thinking about it, I realized that by removing the stay I had at least 4.6 oz to work with to keep the same amount of weight as if I were to use the stay. So, happily I realized that with the blue ccf pad cut to size (and doubled over so that it is 2-layers thick) actually weighs 1 full oz less than if I were to use the stay (3.6 oz)! I am sure that I am giving up some of the ability of proper weight transfer, however with the weights I will be carrying I think that it will manage well. Also, since I use the ccf pad inside the pack, I am able to roll more of the top of the pack down, which means I can compress the pack a little better. So, as can be seen in the second video, my gear fits inside the pack ok when using the foam back pad. The top does not compress down as much as I would like, but that should be ok. I will be leaving for a 4 day (55 mile) trip in a few weeks so this should be a great time to see how the pack does for me. To be honest, I wouldn’t mind having a smaller volume pack, but in my search I haven’t really found any other packs with a smaller volume and offers what the Swift offers. For this reason, I am going to keep the Swift rather than send it back. You guys must not live in the mountains. 🙂 Here, it sometimes snows at night, in July or August! I use dakota pits if I decide to cook anything, which aint gonna happen unless I shoot some critter. I just carry instant oatmeal, almond butter, Tang, and powdered gatorade. Most of the Tang and all of the Ade is mixed into the drinking water, but some of the tang is mixed with the butter and oatmeal to make my “cookie dough” trail mix. I favor a hammock, poncho and rain pants as my shelter, with a highly modified, heavy-duty mylar blanket-bag (with liner, removable hood (and drawstring). i used velcro to make the bag convertible into an item of clothing, and also to make it into a flat ‘blanket/ fire-reflector, sun-reflector. I’ll look forward to the GG review. Cheers. Thanks Stick. I just watched both parts. Good review. I’m still debating the zpack or the Gossamer Gear ultralight Gorilla although it weighs in at a not-so-ultralight 27 oz. or a Kumo at 15 oz if I can get my bulk down (although I’m nervous about not having a padded hip belt). Your review helps me a lot in my final decision. I appreciate your effort. Cheers. Funny thing…I am waiting for a GG Gorilla to come in the mail sometime so that I can review it. I plan on using it on my trip coming up next month, as long as it gets here in time. Hope you’ll do a vid on the zpack. Cheers. Already did! Here is a link to my write up on the Blast 30 pack. Also, just so you know, the Blast 30 pack is a winter size pack for me. For the other 3 seasons, I have been using a smaller (24.5L) ZPacks Zero, size small. Here is a write up on that pack as well. Thanks for the video review. It helps a lot. My concern watching the vid is with load balance. If you have a full platypus in the long external sleeve, ideally it should be balanced weight wise with something in the small side pocket on the opposite side. Finding something small and heavy may be a challenge. Maybe I’m making something out of nothing. Any insight from your trip? I will admit that I ended up selling the Swift pack. It is a great pack, but it was too close to the same size as my ULA Circuit, and I could only justify keeping one or the other. I ended up buying a smaller, much lighter ZPacks Blast 30 pack and sold the Swift to help pay for it. The Blast pack is the size pack that I originally wanted when I bought the Swift. talking with them and weight issue… So would the ohm or the swift be a direction to consider? and MH Drystein and WM down for warmth any suggestions on gloves that wick and also trap heat on 0-10 degrees days? I have no experience with the Ohm other than looking at them very briefly at Mountain Crossings (at Neel’s Gap). To be honest, I didn’t even really compare it too the other packs. I even briefly saw the Air-X too but did not study it. In my Circuit, I have not topped more than about 30 pounds, in the Swift, about 22 pounds. When I was using my Swift, I did not use the hoop stay but rather a piece of ccf pad as the back panel/frame. This worked out very well with the 22 lbs I carried in it. No problems. Based on this, I would imagine that the Swift would do fine with 30 pounds, and possibly even more than 30. However, in the Swift if I was planning on carrying at least 25 pounds I would probably have used the stay. Part of the reason that I did not use the hoop stay is because the stay was so tall that my gear was not bulky enough to come close to the top of the stay. So, when I closed the pack up with my gear inside it, the top 5 or so inches was a bit awkward because there was nothing there. But, since the stay was this tall, I could not do anything about it. So, this is mainly why I used a ccf pad. I could cut it as short as I wanted so I could roll the top of my pack down to the level at which my gear was. I say all of that to say that in my opinion, it was a relatively big pack. This could be a good thing for you though because it would drop weight over that Air-X, but you would not sacrifice too much volume. If your gear is truly lightweight, but a little bulky, the Swift should be ok. A good thing to remember too is that that extra bit of extension collar could be handy for fitting in a few extra days worth of food, or water inside the pack. But, the cool thing is the weight. I could strip everything off of this pack and it was less than 15 oz. With the ccf pad inside it and the wing hip belt, it weighed in at 22.4 oz. This was not a bad weight. With the OHM, since you said that you carry a lot of water, I would probably suggest to go with the OHM 2.0. It is the OHM pack on a Circuit frame, so with it you will sacrifice a good deal of volume, and a fair amount of weight. But, in turn, the 2.0’s beefier frame will carry a heavier load more comfortably. I know I probably did not help you out much. Sorry. But I would suggest calling Chris at ULA and explain to him your situation, and what you are trying to achieve. Just ask him what he would recommend. I would also call Ron at SMD and do the same. Let them tell you about the packs. From what I hear, both of these guys will help you out, even if that is by recommending a different companies pack. I am looking to buy a new Ultralight pack and really liked your videos and comparisons of the Switft and Circuit packs. How has the Swift done this summer? I am trying to make a decision between the Mariposa Plus, the Swift and the Circuit? Do you have one that you now prefer over the others. Thanks again for the great blog and videos. I must be honest, despite the large size of the Swift, I have grown to like it more. However, it is not my Circuit. At this point, once I start carrying my “winter” gear, I will grab my Circuit. I can probably use the Swift with the stay in place, but I feel like for weights closer to 30, or possibly more, the Circuit is all over it. The most I have carried in the Swift is about 24 pounds, and that was without the stay, but instead a piece of blue ccf pad cut to fit int he pad pocket. The pack really did good. No complaints in the way it carried. In fact, with that weight I did the most daily mileage so far, which was 20.1 miles on the AT! A big reason I would go with the Circuit over the Swift is simply because the Swift does not have load lifters, and I like my load lifters, especially if my weight is going to be nearer 30 pounds. I feel like they make a big difference in the way the pack will shift the weight using them. I really wish that the Swift had them, but I can see how it is appropriate for it not to have them either. This is more of an “UL” pack than the Circuit. Saying all of this, I really want to get either a ZPacks Blast 20 or a Zero (size small) to use as my “UL” pack. Hopefully, I will be able to get one next year, but I will just have to see. But once I do it will replace the Swift. The Swift is too close to the size of my Circuit and it is hard to justify having 2 of the same size… In the end though, they are both great packs. Thanks for the information. Your website and videos have really helped me go through a lot of gear options and ideas. Cool, I wasn’t really planning on getting my new pack until next year so just shoot me a message when you’re planning to sell! Nice review on the pack. Just curious of the other packs you considered. 2-3 that come to mind for the volume that you are looking for was the Gossamer Gear Gorilla. About 5 oz heavier but has a padded hip belt and they supply a sit pad that slips in a sleeve. And the MLD Prophet or Burn. Also, what quilt did you order? To be honest, at that time, I figured 2800 cu in would be too small, and I was thinking that 3400 would be more appropriate for my load. (But now that I have the Swift, I am going to say it is no where near 3400 cu in. It is the same size as my 4200 cu in Circuit, and I believe that the Circuit is accurate.) Anyway, considering that my quilt is just sitting inside my pack, there is plenty of room even if I compress it just a hair more. Also, I would really rather have some sort of stay to use as my structure than a foam pad since I don’t use foam pads. Although I do like that the Gorilla comes with the foam pad. My plans are to go ahead and keep the Swift and use it for now. The fact is I can use a foam pad which is 1 oz lighter than the stay to provide structure. Also, by using the foam insert, the pack itself is not as tall as when the stay is inserted, so I can roll the top down a few inches more which will get closer to where my gear is inside the pack. However, later this year I will pick up one of the ZPacks Blast 26 packs to fill the niche that I wanted the Swift to fill. The Blast 26 is slightly less than the 2800 cu in that I am shooting for, however, with my new quilt and some other tiny changes, this will be no problem, and I am really imagining it will be a little big too. Plus, I can add what ever I want to his packs. I will be adding of course the hip belts, stays, and a top side pocket. Total weight will be 10.1 oz and the price will be just a little more than the Gorilla. Anyway, once I get the Blast 26, I will sell the Swift since it is the same size as my Circuit. Considering this, I like my Circuit more. As far as my quilt, I ordered a custom quilt from Javan Dempsey. He builds quilts under the label The Stateless Society. I sent him all of my general size information as well as my sleeping style for him to determine the cut to make my quilt. The quilt will be made from 0.9 Intrepid and using 900 goose down fill with approximately 1.5 in baffles and should weigh between 13 – 13.5 oz total. he emailed me the other day and told me that there are about 2 more in front of mine, so it won’t make it here in time for my trip coming up, but maybe soon after I am back! Montbell has a wind pant that weighs only 2.8 ounces, I think. Their not waterproof, but would be fine in Summer. Sorry I cannot remember the name, but check out their site. I came across those a while back but since they are not entirely waterproof I was not interested in them. For summer though I use the ZPacks CloudKilt which also doubles as a ground sheet. Stick, I have one of the earlier versions of the Golite Reed rain pants. The later versions weighed around 6 or 7 ounces. I noticed the ones still advertised are listed at 6 oz, however, none of them are even in stock. The Montane Featherlite Pants look to be comparable to the Reed pants though. They are listed at 4 oz. Stick, I’ve had the Golite Reed pants for several years. Mine is the older version. Size Medium. The 3.1 ounce fuel cannister is a small Snowpeak Giga Power, empty. When I figure my consumalbes, I will add 3.9 ounces of fuel to my food. Gotcha on the fuel canister weight. I haven’t thought about listing it like that, but I knew it sounded like an empty canister! 🙂 I don’t usually carry a canister stove. I love my WBS, however, at the moment I am testing the Jetboil sol so I am carrying it for now… As for the Reed pants, like I said, I have heard great things about them from a lot of people. Too bad they stopped selling them. For 4 oz they sound like an obvious choice! Stick, Here is my gear list, for Summer in the S.E. mountains of the USA. I carry no camera, cell phone, or any other electronics. I quit taking photos years ago. I did not include the clothes I wear, only what is in my pack. I do not wear the rain pants in the in Summer, but wear them in town to do laundry, and on the trail when at camp, and it has turned cool. I pack my clothes and sleeping bag into the 13L Dry Sack. The way I pack the Circuit, I place my Thermarest as a cylinder inside the pack. Place the 13L Dry Sack, and Tent inside the cylinder. My Kitchen pot, with stove, gas cannister, and Bic lighter inside a mesh ditty bag go on top of the tent. Next will be my food bag, and rain jacket. To tighten up the pack, I inflate the thermarest. My Playpus, ground cloth, and toilet paper go in the front mesh pocket. Water bottles in side pockets, and miscellaneous items in hip pockets. Nice gear list! Thanks for posting it. I have heard a lot about the Reed pants, and wow, at 4 oz, I see why! What size are those? What kind of fuel canister do you have that weighs 3.1 oz? When my canisters are that weight they are about empty. I do carry electronics. My cell goes with me, and I like to have a camera. I enjoy taking pics, but I also have to have pics of gear for reviews. Stick, I would guess you are trying to reduce your base weight for your Summer trips. There is no reason that you could not do this with the current Big 4, you have. ULA Circuit, Skyscape Trekker, Quilt, and Neo Air. I have a Circuit, TT Sublite Sil, Montbell UL Down Hugger 5, and a Thermarest Prolite 3 (old style) And have a baseweight under 10lbs. Try looking at the items in your pack list, that are not in your Big 4. There is where you can reduce a sizeable amount of weight. At my age, I am not very good with a computer, or I would send you my gear list. But if interested I could type it out here on your blog. Let me know. Keep up your enthusiasim for our sport. I should’ve posted my gear list when I originally posted this, so I went back and added it in the post just recently. I have my pack weight pretty minimal in my opinion (although I do know that it is not minimal compared to a few UL/SUL backpackers) and I have cut out things already, however I do still carry a few luxury items (pillow, kupilka cup…) that I would rather carry than leave behind. Stick, I had also ordered the Swift, but returned it for a refund. I found it too similar to the ULA Circuit. And did not carry as well as the Circuit, due to the flimsy hipbelt. I prefer a suspension pack, or hoop pack, and currently looking at the ULA Ohm. When the Ohm came out several years back, I ordered one, and returned it. I think the newer models have several inprovements. Probably wait awhile before trying it out again. I totally agree with you, it is very similar to the Circuit. For this very reason, I am having a hard time justifying keeping it cause I love my Circuit and am not looking to replace it with anything. However, my problem with the OHM as well as the CDT is that they are essentially the same size, by looking at the specs. Although specs can be deceiving so I wouldn’t mind getting my hands on one of the OHM’s or the CDT’s.